of the Holy Spirit, one God, for ever and ever. Amen." Join us on the journey from darkness to light, from the cross to the tomb to resurrection, from death to life. This consecrated week is surely the most important moment of worship in our Christian year, and we invite you to fully immerse yourself in the story. 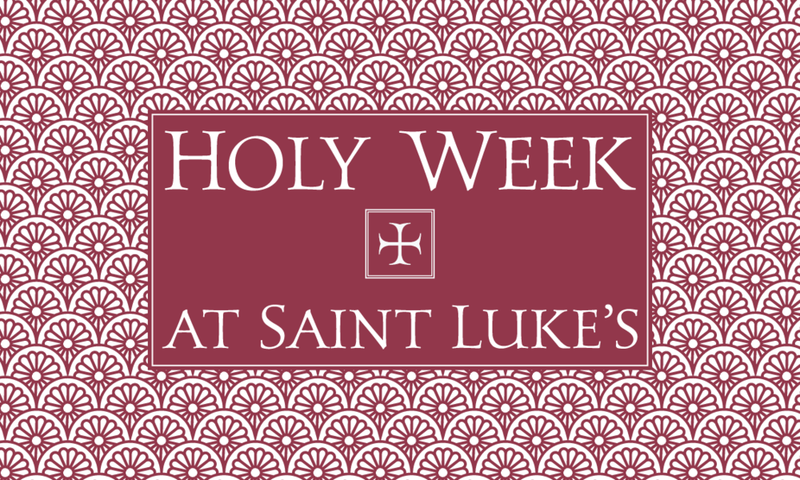 We begin Holy Week with a festive procession, enacting the Triumphal Entry of Jesus into Jerusalem. The celebration gives way to the reading of the Passion account, as we, with Jesus, "set our faces toward Jerusalem" and enter the drama of his trial and crucifixion. This service focuses on the Upper Room, and Jesus' institution of the Last Supper (Holy Eucharist). The word Maundy comes from the Latin mandatum, meaning "commandment." Jesus gives a "new commandment," that we love one another, and proceeds to show us what love looks like in his journey to the cross. The service ends with the Stripping of the Altar in preparation for Good Friday. We invite parishioners to "pray and keep watch," as Jesus asked of his disciples in the Garden of Gethsemane. There will be opportunity to sign up for time slots throughout the night. This service will recount the message of the Cross of Christ, and provide many opportunities for us to meditate on the mystery and glory of God's work of redemption on our behalf. This service will feature instrumental and choral meditations. This ancient service dates from the earliest records of church worship, being common by the 4th century. It was traditionally the time of year when catechumens (converts to Christianity) were baptized into the faith. The service begins in the darkness of Good Friday, and then the Paschal Candle is brought in, as the priest intones: "The Light of Christ." There are scripture lessons read from the Old Testament retelling the mighty acts of God (Creation, Flood, Exodus) and sharing the prophets' visions of the new life and new kingdom that God will bring. As this portion concludes, we ring in the Easter Season with the Great Alleluia and Troparion (Christ is risen from the dead, trampling over death by death!). The service then continues with baptism (or renewal of baptismal vows) and communion. Our service will include dramatic and musical elements to enhance the telling of God's story. It will be a unique and wonderful service that will, by God's grace, transform and enliven all who attend. We will continue our Easter celebration on Sunday with joyous worship. The adult choir will enhance our worship, and there will be an Easter Egg Hunt for families directly after the service.